An historian could make a strong arguement that Greensboro has sought suburban design standards since it was developed in the early nineteenth century. Images from the late 1800s show the city brimming with gardens (in fact, it was named the "City of Flowers" long before it was the "Gate City"), shaded streets, and large houses set on ample lots of land. It should be no surprise, then, that the city has been challenged envisioning what an urban streetscape is, and how exactly it can be/should be excecuted. Say "urban" to many Greensburgers, and they imagine wide roads with fast traffic, hot sidewalks, towering skyscrapers...basically downtown Charlotte. It doesn't have to be that way. The right hand scene is Beech Avenue, located in Pittsburgh's North Side neighborhood. Like Washington Street in Greensboro, the avenue pictured was laid out in the mid-nineteenth century with Victorian residences. Unlike Greensboro, this street took on a denser "urban" appearance from the beginning. Though it is located in Pittsburgh, the scene could be replicated in any of the established urban neighborhoods of the northeast, such as Beacon Hill, Park Slope, Society Hill, or Georgetown. Starting from the ground up, the Beech Avenue sidewalk is paved with bricks, scaled to the size of a person's foot. Other details include parked cars along the side of the road which insulate the sidewalk from the rush of traffic (who likes an Escalade whizzing past them at 30 mph only two feet away? ), street trees, and decorative streetlights. Insert a few flowering window boxes or planters, and you are close to replicating the look and feel of a nineteenth century sidewalk. The granite curbs and brick gutters along Blandwood Avenue (both north and south of West Washington) are one of the best street details in Greensboro. The brick gutters have been gouged and battered by snow plows and maintenance, but still impart a very intimate scale to the street, even humanizing the neo-Brutalist county jail. I wonder if those "minor" details will survive the destruction of the Zenke houses and the construction of the new county jail? Have you seen the new "sidewalk" on Pisgah Curch Rd. between Lawndale and Battleground? I suppose we should be thankful for any attempt to make Greensboro more walkable, but mailboxes and telephone poles make this one an obstacle course. Trash cans on garbage day make it even worse. "An historian could make a strong arguement that Greensboro has sought suburban design standards since it was developed in the early nineteenth century." I'm glad you wrote this. 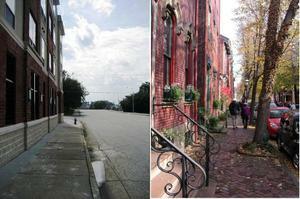 I've been contemplating a photoblog post on G'boro's center-city sidewalks, but you beat me to it. Roch101 - I have not seen this section yet, I need to take a look soon!